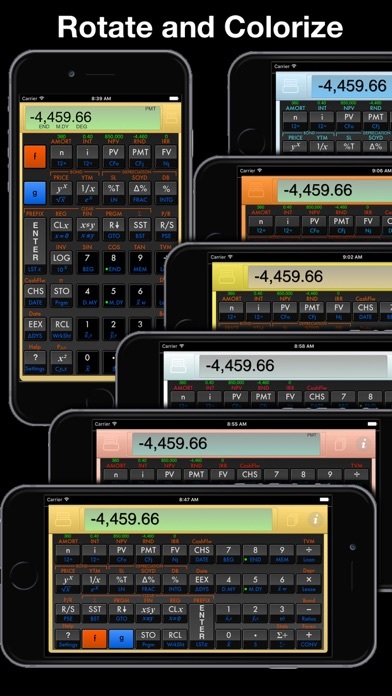 12Calc is a full version of the well known HP12C for the iPhone and iPad. 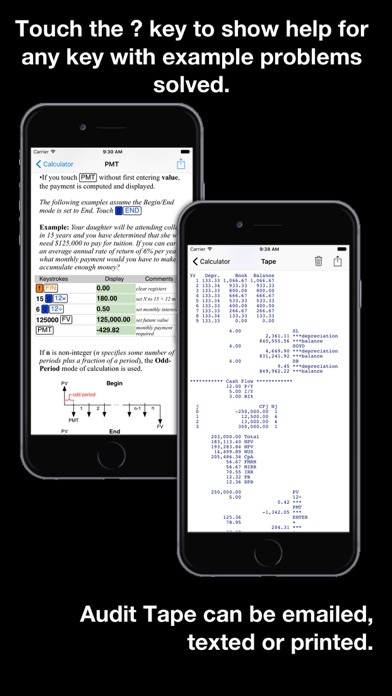 It also includes an audit tape, unit converter, worksheets, rotated views, user guide and HD graphics optimized for iPad and iPhone retina displays. •Runs in 64 bit mode on the latest iOS release and new iPads and iPhones. •Calculations are highly accurate and blazing fast. 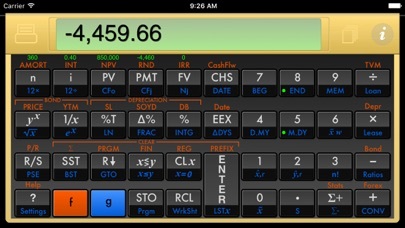 No more "running" flashing displays for amortizations, depreciation schedules or interest calculations. Work as fast as you can type. •Audit Tape: The audit tape keeps a record of your calculations. You can review, mail, text, share or print the tape. 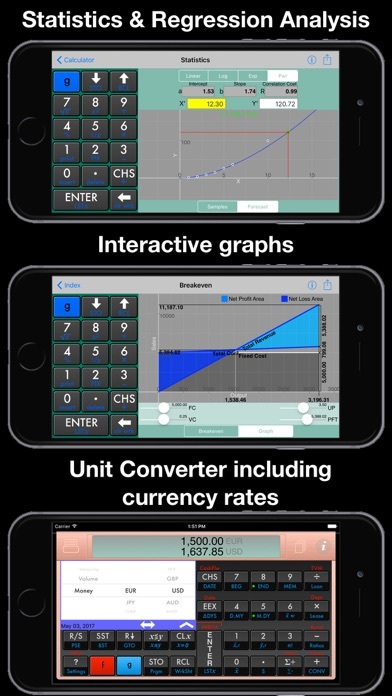 •Unit Converter: Convert between a wide variety of common units and currencies. Currency rates can be downloaded from the internet. •Work Sheets with interactive graphs: Auto Purchase Black-Scholes Bond Break-even Cash Flow analysis Currency Date Depreciation Interest Conversion Lease Loan Amortization (includes option for Canadian mortgages) Margin&Markup Ratios Refinance Statistics Tip TVM •Views for all orientations: Portrait and landscape renderings of the full keyboard are provided for iPhone and iPad. 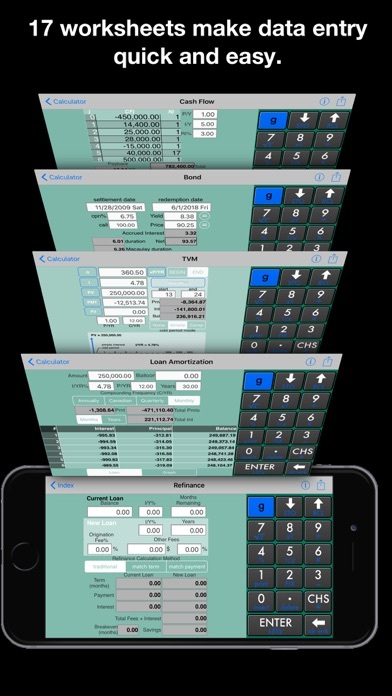 The iPad version includes slide over and multiple split view displays as well as side-by-side display of the help page, audit tape, tvm mortgage table or program variables. •Built-in contextual help: Touch the ? key for a description of any keyboard function with examples of use. If you are just learning or can't remember how to use a function- just touch the ? key. Includes tutorials on how to use reverse Polish notation (RPN) and how to solve time value of money problems. •HD Graphics: Graphics optimized for both retina and standard resolution screens. Choose from multiple color schemes including gold, rose gold, brass, copper, silver and several color tints.